Anyone – at any age who has spent time with a horse – in a situation where communication takes place is fully aware just how smart and interesting horses are. They have the capacity for extreme intelligence as well as having a memory second to the elephant… Horses are aware of everyone and everything around them, although they don’t just let anyone into their world. Self preservation is number 1 and working together as a herd is number 2 in importance. They continually test each other for pecking order which is based on leadership skills and trust. Horses are simply amazing- spirited, curious, communicative, athletic, cooperative -yet each are individuals and they fit in with ‘almost’ all other species. They are easy keepers as they get by on just eating grass and other plants… Yet when managed by humans, the balance they so easily thrive on – on their own, changes in ways that can become life threatening in captivity. Yet we insist on baiting them, driving them from their natural environment into holding facilities and then taking them to slaughter or adopting them out. This control should not be our call, we humans lack the ability to determine who is worthy and who is not… The greatest thrill of a lifetime is watching a band of horses out on the range going through the motions and simply living their lives one day at a time. I didn’t grow up with horses. I rode a bit as a kid but I wasn’t intelligent enough to understand them. 1999… The plan was to sell our Colorado house and retire to Montana. I’d been spending summers in MT since 1982, my husband – a Montana native was now retiring early. Having sold our totally remodeled house in SW Portland, Oregon just 2 years previous – it would be tough to go back- so we go forward. We had replaced the Montana garage with a Canadian Cedar log house kit we had designed and built in just 3 months- 1996. The following summer was spent finishing the house inside. Then the job transfer came – Fall ’97… We sold our Portland house, I gave up my final opportunity to complete my masters degree. We settled in to Pine CO – just outside of Denver. Three months later the job and the company we transferred to was to be closed down. I continued to work for a consulting firm- Database design for US west and CU Boulder. My husband took a job in Boulder. Living in Colorado would have been fabulous had I taken time out of my 16 hour day to look at something other than the computer screen. It was my goal to make it work – as usual, but some things you simply can’t force. Living in Colorado wasn’t meant to be – for me. Fall 1999 in Montana, skiing during the week, hiking as often as possible, work as much as possible (for me). It was the dream life we’d given our all for – for 16 years… Work really hard and retire early. Here we were – both with pretty huge regrets. apparently. Fall of 2000 our long time Portland friends were coming to visit. Lee and I had lot’s in common- especially woodworking. Susan loved to cook and she was really into horses and riding and all that goes with that lifestyle. I had ridden as a kid but there was no actual attraction to horses. Or so I thought. The thought was to take some riding lessons so Susan and I would have something to talk about. I took 2 lessons before she arrived and one while she was visiting. 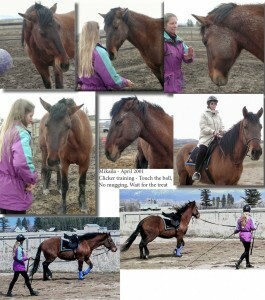 I became totally addicted, obsessed and consumed by everything horse… (To this day Susan and I still talk about horses and she still visits) The trainer I took lessons from retired her horses in November for the winter. But she had a friend who “might have a horse I could lease”. We drove out to meet ‘Jimmy’ a chestnut quarter horse that I could lease. That same day- they brought in ‘April’ – a 2 1/2 year old Percheron Quarter horse filly… ‘She was for sale’ they both said…. … …….. She’s a Dun…. ….. I got to ride her – not knowing much about young horses… She had a kind and beautiful eye.. I walked her around the arena after our ride. She felt like my new best friend… the one who wanted to be with me- walk with me and do stuff together. My heart had been empty for so long… I had been kept busy for decades working hard for retirement and here we were- actually here I was. alone still. All I knew was that this horse inserted her heart into my head and attached herself to my heart and she was all I thought about for weeks… This is now known as the horse bug – you have it or you don’t. Jimmy went back after a few weeks- turns out he had dumped someone else before me. This simply wasn’t a good fit. I went back to visit April – this horse I couldn’t stop thinking about and 3 weeks later she was mine… I boarded her for a month and took 3 riding lessons from the owner. I felt OK as long as the horse didn’t move. Then I was OK if she followed another horse. It took years for the fear to subside. My love for this horse never wavered. April was re-named Mikaila – which means ‘God like’… There hasn’t been a single moment since January 21 2001 where I’ve regretted having her in my life. Fast forward to 2013. Mikaila is still with me, Susan’s horse Starry has come here to live, and I brought home a grey appaloosa – a girlfriend for Mik in 2009. These horses are my reason for living, I have learned a ton. and I still know – I don’t know much. I am humbled by horses. I wish I could share what I’ve learned with the folks who work for the BLM – the ones who decide a horse should go to slaughter. One week with me – the things I could show them – would change their world. Enough said for now.